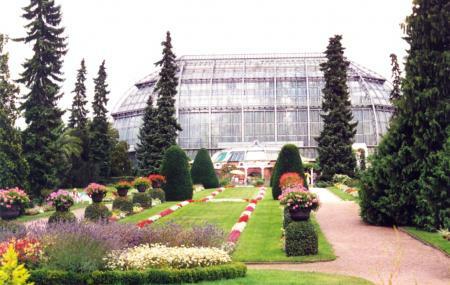 Berlin Botanical Gardens also known as Botanischer Gardens are a heaven for any botany lover. Spread over 43 hectares of land, this place offers you a getaway from the usual hustle bustle of the city. It basically offers you a perfect chance to connect with the nature and understand the plant world in such intricate detail. It has around 22,000 species and an accompanying museum to help you understand the intricacies of the botany world. All in all, even if you are not too interested in the botanical world- you are sure to develop an interest and fall in love with the amazing plant life that you will witness here. Library is open from 9:00 am-5:00 pm from Monday to Friday. Check the library page for further information. Check revised and updated timings on the website. Please check the official website for other timings. How popular is Dahlem Botanical Garden And Botanical Museum? People normally club together Olympia Stadium and Tranenpalast while planning their visit to Dahlem Botanical Garden And Botanical Museum. People also prefer to start their day with Dahlem Botanical Garden And Botanical Museum. Among the best botanical gardens in the world. Interesting outdoor spaces but also many indoor collections if you are visiting on a rainy day. Wonderful collection of cacti. Beautiful nature paths. Definitely a worthy part of any visit to Berlin. This was the best botanical garden that i have visited during early Spring. Its very well priced and the glass houses were brilliant, ferns, cactus, Tropical, so many different rooms and each was throughly enjoyed. Take a picnic if the weather if good and even a few beers like i saw some locals. The coffee shop also serves lovely cold, big beers) Thumbs up on that and the gift shop has some lovely items. The outside grounds weren't quite in bloom yet but they were still beautiful. The many and massive greenhouses were amazing. Different regions of the world, different climates and all were meticulously cared for. Beautiful Botanical garden. They have plants from all continents. It is also interesting in winter time because the glasshouses with plants are huge. So you don't have to be afraid that you wont have anything to see if it's winter.